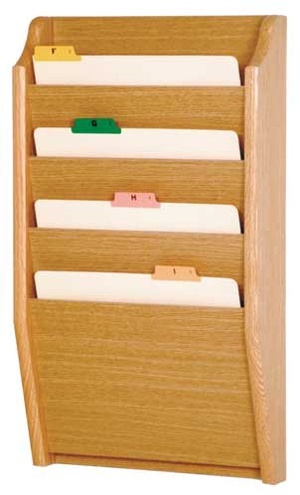 Attractive wall/ door files neatly organize various printed materials, while keeping your information private. You can maximize your file storage potential in a smaller amount of space with the convenient overlapping design of the rack. "Excellence in wood products manufacturing is Wooden Mallet's primary goal. To make this possible, I believe in a family of trained and dedicated employees, top quality materials, and the most modern equipment and facilities. With these tools, we can bring to our customers a consistently superior product, prompt ship times, and a smooth running partnership." - Jim Kreber, Owner For the past 10 years, Wooden Mallet has ranked consistently in the top 100 of the Wood & Wood Products, Wood 100 Annual Report for Solid Wood and Panel Technology.